Watch our Video to learn more about DRI-Z-AIR. How does Dri-Z-Air remove excess moisture from the air? Dri-Z-Air crystals absorb moisture from the air. Excess moisture can cause mold and mildew to form. Using Dri-Z-Air will keep this from happening. It’s simple! How do I use Dri-Z-Air? To use Dri-Z-Air, remove the clip and lift off the upper half of the grill-work compartment. Open one envelope of crystals and empty it into the bottom half of the grill-work compartment. Replace the top half of the grill-work and the clip. Dri-Z-Air is ready to use. Where can I find Dri-Z-Air products? You can find Dri-Z-Air products at your local participating store. Please see the list of Dri-Z-Air retailers. How many Dri-Z-Air units do I need? We recommend one Dri-Z-Air unit for every 10’ x 10’ space. For example, use one Dri-Z-Air unit in a small bedroom or three Dri-Z-Air units in a 25’ motor home. The placement of the units is important. In a 25’ motor home, place a Dri-Z-Air unit in the rear, middle and front. Do I need to dispose of the Dri-Z-Air liquid daily? The Dri-Z-Air unit does not have to be emptied until all the crystals have dissolved. The liquid in the bowl will not evaporate, but will continue to collect moisture. We do want to caution not to spill the liquid, since it collects moisture. If you have the Dri-Z-Air units where they might get bumped or kicked, please put the unit on a Dri-Z-Air tray or in a plastic bowl to catch any spills. When filling the Dri-Z-Air unit with the Dri-Z-Air crystals, I noticed some small particles falling to the bottom of the Dri-Z-Air unit. Are these going to waste? No, these are not wasted. They will work the same as the crystals in the basket. Our specifications allow for a percentage of small particles which cannot be avoided. How do I dispose of the liquid in the Dri-Z-Air unit after all the crystals have dissolved? If you are on a city sewer system or septic system, dump the liquid down the toilet and flush with plenty of water. The solution is a highly concentrated salt brine and is non-toxic. Are there any odors or scents added to your crystals? None. DRI-Z-AIR crystals are odorless. How do I clean up the liquid if it spills? Use only plain cold water. Vacuum up the spill with a wet/dry vacuum, soak the area with water, vacuum, repeat several times. Let the area dry. If it stays dry that is a sign that the spill is cleaned. If it gets damp again, repeat the process. Alternatively, use a clean towel or paper towels to blot up the spill. Then dilute remaining liquid with clean cold water and sponge. Repeat blotting process until dry. Liquid is highly concentrated salt water which will dilute with plain cold water. Wash towels in normal laundry. Clean up any spill immediately. Why is Dri-Z-Air corrosive to metal and leather? Dri-Z-Air is calcium chloride, which is a salt product. When the liquid comes in contact with metal for a prolonged period, the metal will corrode. If it comes in contact with leather, it will dry out and become damaged. Why do the Dri-Z-Air crystals change color? The color change is caused by dust from the air. Why do the Dri-Z-Air crystals get hard? 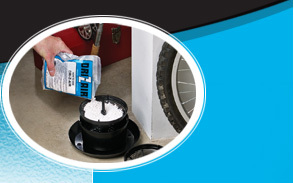 The Dri-Z-Air crystals are calcium chloride, which is a non-toxic inorganic salt product. As with table salt, when they collect moisture, they harden. Dri-Z-Air crystals are like a moisture-absorbing-magnet as it pulls the moisture from the air. When the crystals have grabbed all the moisture they can hold, the liquid will begin filling the bottom of the unit and the crystals will dissolve. Will Dri-Z-Air reduce the humidity to undesirable levels? No. The Dri-Z-Air crystals absorb moisture when the humidity is higher than 50% in the air. If the humidity falls below 50%, the crystals will go into a holding pattern and will begin working again once humidity increases above 50%. Where does your calcium chloride come from? Dri-Z-Air calcium chloride crystals are made in U.S.A.from high grade materials mined in the U.S.A.